TheStar.com – News/Insight – As walls come down and new buildings go up, the Centre for Addiction and Mental Health is focusing on research and innovation, and changing how mental illness is viewed. Now, an anonymous $100-million donation will give the project a major boost. Tom Churchill lived a life of hidden woe. The 67-year-old Toronto investment manager, father and husband had suffered an inner depression since puberty. “It looked successful from the outside,” Churchill says of his life. Then, in August of 2015, a “miracle” happened — magnetic magic in the form of depression-fighting technology being offered at Toronto’s Centre for Addiction and Mental Health. Known as Repetitive Transcranial Magnetic Stimulation — rTMS — it was used to alter haywire circuitry in Churchill’s brain and lift his burden of sadness for the first time in half a century. “It was a 20-day round of treatments, and on the ninth day I walked out and the world had transformed,” says Churchill, tears welling in his eyes. While rTMS has been in use since 1996, its effectiveness and scope are being magnified through large-scale studies led by CAMH scientists. This research is part of an ambitious transformation of CAMH into one of the world’s foremost mental health facilities, says president and CEO Dr. Catherine Zahn. That physical, clinical and scientific project will be aided immensely by Thursday’s announcement of a staggering $100-million donation to CAMH, by far the largest ever made to a mental health facility in Canada. The anonymous endowment will be dedicated to research and to the recruitment of scientists from around the globe. Dr. Trevor Young, dean of the University of Toronto’s medical school, says the donation will elevate the centre’s already vaunted international stature. “CAMH is already one of the leading mental health institutions in the world under Catherine’s leadership because it’s very strong in both research and patient care,” Young said in an email interview. Last year the centre, with some 3,000 staff, treated more than 34,000 patients and saw almost 7,000 troubled souls enter its emergency room. The centre treats a wide range of mental health and addiction problems, which often appear concurrently in the patients they see. Some 27.5 per cent of people admitted to the centre suffer from substance abuse, 15.3 per cent from bipolar conditions, 14.3 per cent from depressions, 3.9 per cent from personality disorders and 32.6 per cent from schizophrenia. With 500 beds, the centre’s hospital facilities are among the city’s largest, rivalling other big teaching facilities like St. Michael’s and Sunnybrook. Zahn says the physical transformation, which has come in at a little over $1 billion so far, will take another 10 years to complete. She also says that she’s been in persistent battles for funding and approvals since she took the centre’s helm. But Zahn views the architectural metamorphosis as metaphor — one that represents recovery over maintenance, openness over isolation and an emerging acceptance of mental ailments into the mainstream of modern medicine. A 1910 map of the city’s western outskirts hangs on the wall in Zahn’s CAMH office. On that map some sepia-toned housing developments are seen, having sprung up in the Queen St. W. area during the early part of last century. But even earlier drawings show how isolated the original institution on that site was, Zahn says. 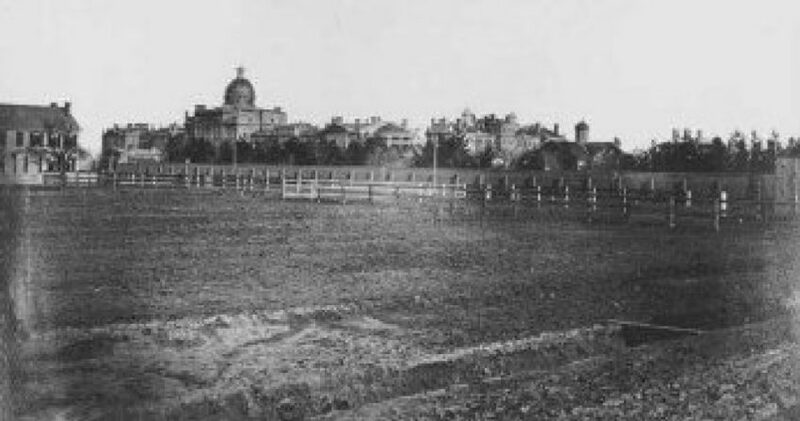 That would be the Provincial Lunatic Asylum, which opened in 1850, far removed from populated areas of a young Toronto. Patients there were forced to labour on the asylum’s adjacent farm and lived in overcrowded conditions almost from the day the facility opened. Generally men also did construction and maintenance work, and women did sewing and washed clothes. 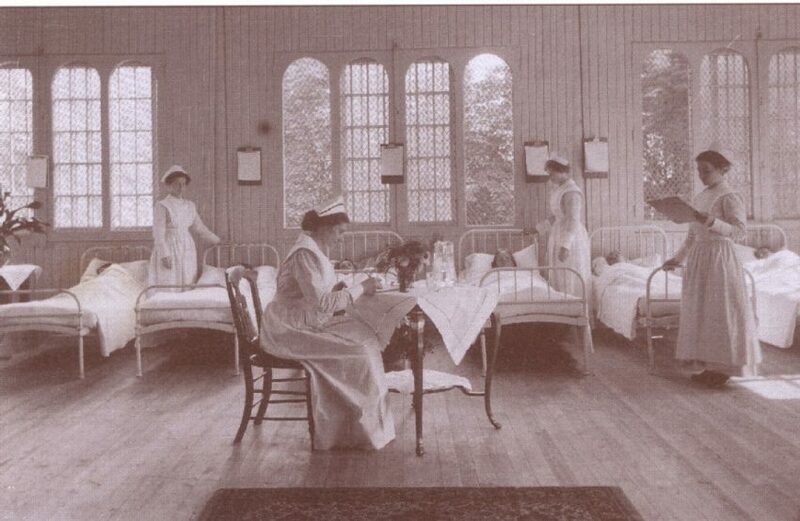 The asylum was isolated further by a brick wall that was erected by patients in the 1850s. Today parts of the original walls still stand, and are protected as heritage structures. “So with the city building up around it there was still this amazing force field that didn’t allow the world to be in or people to get out,” Zahn says of the fence. The idea that mental illnesses were dangerous and shameful things — walled-in conditions to be hidden away and forgotten — was widely ingrained until recent decades. Indeed, the centre’s albatross address — 999 Queen St. W. — was a common shorthand and source for derisive humour among many city residents, right up through the 1970s. That notorious street number, for what was then known as the Queen Street Mental Health Centre, was changed to 1001 Queen in 1979 in a nod to the more enlightened attitude toward mental illness that was beginning to emerge. But that enlightenment has a long way to go even now, concedes Zahn. Helping to edge it along, however, has been one of her key goals since 2009, when she took the CAMH reins. 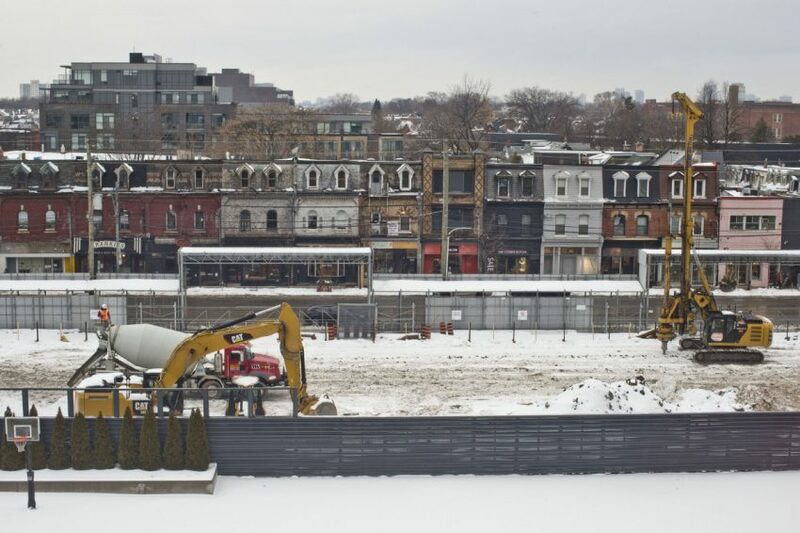 It’s been a multipronged approach, perhaps the key element being a continued redevelopment of the centre, which broke ground three years before her tenure under Dr. Paul Garfinkel. Garfinkel led CAMH for more than a decade before Zahn. By the 1970s, evolving policies of patient care led to the demolition of the original Provincial Insane Asylum building in 1975. Scientists by then were also getting a much better understanding of the brain’s functions. 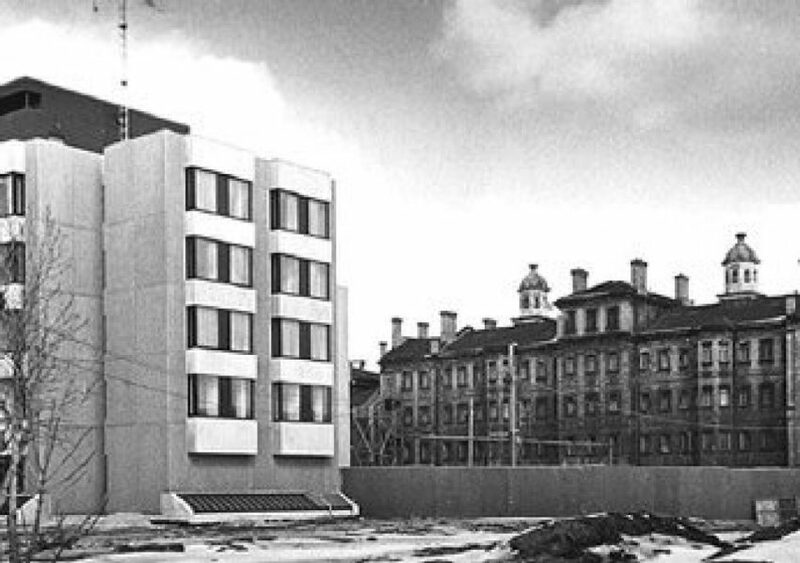 1972: the former Queen Street Mental Health Centre. 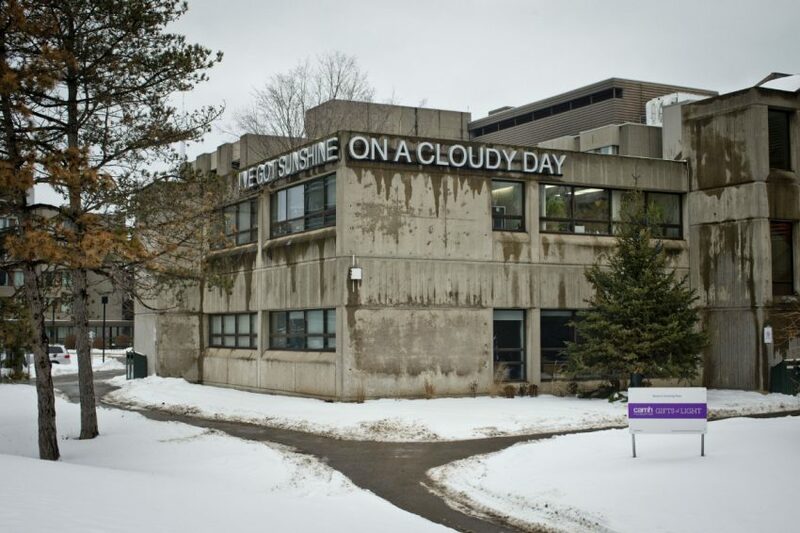 In 1992, the Vivian Rakoff Positron Emission Tomography (PET) Centre opened at CAMH, Canada’s first PET centre dedicated to medical imaging research into mental illness. In 1997 the provincial Health Services Restructuring Commission announced it would amalgamate the Clarke Institute of Psychiatry, Addiction Research Foundation, Donwood Institute and Queen Street Mental Health Centre. It promoted a shift from hospital-based to community-based mental health services. In 2001, the centre announced plans to transform what was essentially a foreboding fortress into an urban village. It would be woven into its west-end neighbourhood by pushing new roadways through the closed-off complex and trading out homely and intimidating architecture for a host of sleek, modern structures. That redevelopment is now well into the third of four planned phases. This one is completing the replacement of the brutalist concrete buildings along the centre’s Queen St. frontage with far more inviting structures. The eastern building, with an airy glass wall facing Queen St., will house people recovering from complex, long-term illnesses like schizophrenia and intractable depression. It will also hold a performance auditorium and a public courtyard, accessible to the street and leading to a park at the centre’s northeastern corner. The western building will serve as the centre’s emergency department and acute-care facility and will look more like a conventional modern hospital. There will also be retail units such as coffee shops along the street in front of each building. And one of Zahn’s main hopes is that the physical transformation will encourage broader public acceptance and greater government funding for a wider range of psychiatric conditions. While some illnesses, like anxiety and depression, now attract ample health-care support, others are still starved of acceptance and financial and legal backing. “People who have especially complex mental illnesses, illnesses that cause psychosis, still do not enjoy the rights of most of us,” she says. She says, for example, that health care for people with complex ailments like schizophrenia is severely underfunded. Zahn, who was born in rural Ohio, is a neurologist who was previously an executive and physician at the University Health Network. She’s lived more than four decades in this country, earned her MD at the University of Toronto, and has been awarded the Order of Canada. Part of her strategy is to recruit top-flight researchers and to launch cutting-edge clinical and scientific centres at CAMH. So far that plan has seen significant success, with researchers from Harvard University and other top neurological centres across the globe having come to CAMH over the past years. Zahn points, as an example, to the Slaight Centre for Youth in Transition, which opened three years ago as the first facility in the world dedicated exclusively to diagnosing and treating young people experiencing their first psychotic episodes. The centre has developed standardized assessment and care protocols for ailments like schizophrenia and has brought wait times for appointments and diagnosis down from months to an average of one week. Quick diagnosis and treatments for psychotic illnesses not only bring greater peace of mind for patients and their families, but lead to much better outcomes in fighting the diseases, Zahn says. In September, CAMH also announced the creation of the Krembil Centre for Neuroinformatics, which will employ artificial intelligence and big data computation to plumb the workings of the human brain. The new computer centre will crunch this information, seeking connections that could lead to a better understanding of neurological illnesses. Zahn’s team recruited Dr. Sean Hill, from the international Blue Brain initiative in Switzerland — a collaboration between IBM and the École polytechnique fédérale de Lausanne — to run the new centre. Vasdev had previously worked at CAMH before he was lured to Boston in 2011 to create a new radiochemistry centre at the Massachusetts General Hospital. In Toronto, Vasdev will lead a team of researchers looking for new radioactive tracer chemicals that can — among other things — be attached to drugs, making them visible to PET scanners as they work in the brain. “We’re absolute world leaders in this,” says Zahn, noting that almost half the brain tracers already in use were created at the centre. Another of CAMH’s cutting-edge facilities is the Temerty Centre for Therapeutic Brain Intervention, where Churchill was treated. For decades, Tom Churchill had battled his profound depression. Through sheer force of will, he hid it from all but his parents, siblings, wife and a few close friends. “It was an act for sure,” says Churchill. “I made a point right from the beginning of not letting other people know about my depression.” He even managed to keep it from his three children until they were adults. While alcohol could keep the depression at bay, and often did, no drug or psychotherapy could fully dislodge it, says Churchill, who is now retired. The rTMS system that finally banished his personal black dog targets a segment of the brain know as the dorsolateral prefrontal cortex where many depressions are known to reside. Patients sit in dentist-like chairs in one of one of a half-dozen of the centre’s rTMS suites. Magnetic fields are sent through their skulls and into their brains via coil units that can be placed by a flexible arm directly above the targeted brain area. “Those magnetic fields end up inducing an electrical field within the brain and they cause neurons to fire,” says Dr. Daniel Blumberger, medical head of the Temerty facility. “And what we do is we change the pattern with which the neurons fire and (thus) change the functioning of the circuits within the brain,” Blumberger says. Like electroconvulsive therapy, or ECT, rTMS can normalize the brain circuits that are misfiring in depressive patients, he says. Unlike ECT — which sends direct, seizure-causing electric currents into the organ — patients need not be anesthetized for the gentler, magnetic procedure. As well, the more targeted rTMS does not cause as much disruption to the rest of the brain, avoiding some of the cognitive issues associated with its electroconvulsive cousin. Thus, Blumberger says, rTMS would be preferable to the harsher electric therapy, which still carries a taint (think One Flew Over the Cuckoo’s Nest) despite its proven effectiveness. The therapy is given in multiple sessions over a six-week course, with significant remissions lasting an average of four to six months. Churchill, who has undergone five rTMS courses, has had remissions lasting as long as eight months. The problem, however, is the magnetic procedure fully works on only 30 per cent of patients — most of whom have failed to respond to first-line drug therapies. “We’re studying new ways to deliver the treatment and how to improve it,” says Blumberger, who aims to push positive rTMS response numbers up to 60 per cent or beyond. A happy clientele means a patient base more willing to participate in the large-scale studies that could effect such change, says Zahn. And that’s where the gleaming new buildings and clinical improvements at CAMH will help enormously, she says. Indeed, Churchill’s experience at CAMH encouraged him to bull through an experimental therapy as part of a recent study, even though it made his depression worse. Under Zahn, the centre has increased efforts to expand its operations to communities across Ontario. Outside of its own hospital and emergency room facility, CAMH personnel are instrumental in providing mental health and addiction care in towns, cities and Indigenous communities around the province, Zahn says. To combat the opioid crisis, the centre has trained and dispatched more than 100 staff to screen and educate patients and has preached the philosophy of harm reduction, rather than abstinence. 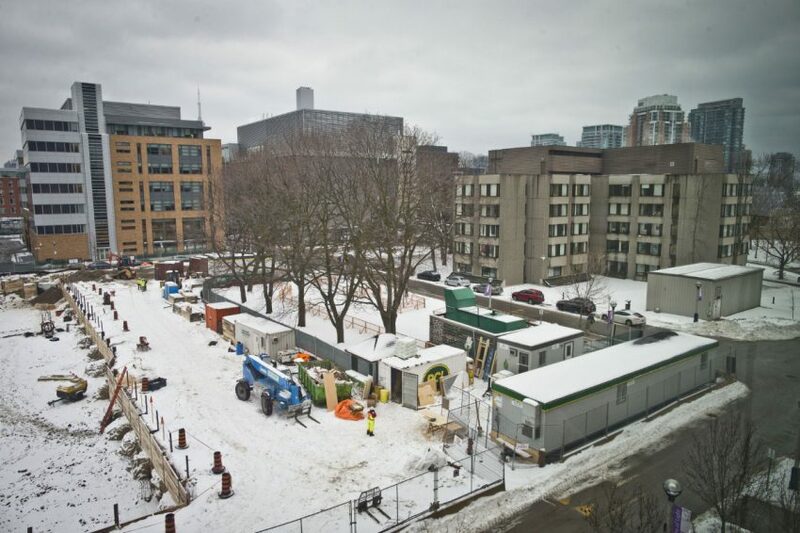 Zahn refers to the transforming CAMH grounds as a campus, partly to reflect the new, open nature of the facility with its green spaces and squares. But the facility of the U of T-affiliated hospital also plays host to some 3,000 medical, nursing and social work students a year, who train there as part of their course load. In the end, however, all the changes she’s helped to lead are aimed primarily at the patients the centre will serve. “What I want people to know is that people with mental illness are citizens and human beings,” she says. 1. 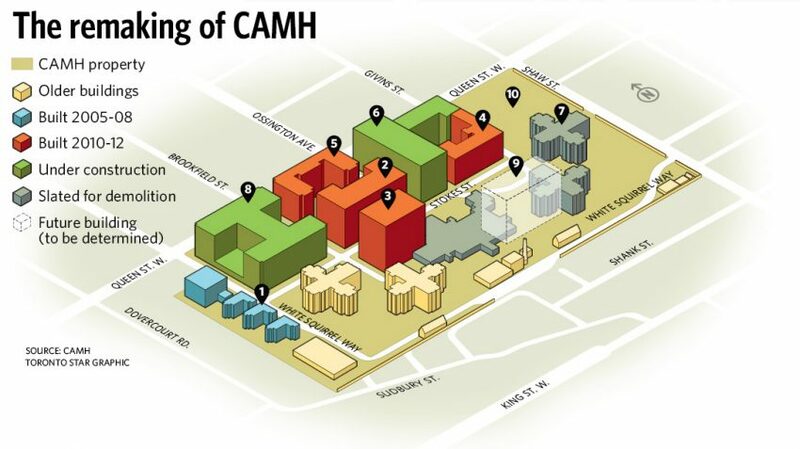 These structures represent the first phase of the CAMH redevelopment project. They house the centre’s Addiction and Mood & Anxiety programs. They include bedrooms with private bathrooms and sedate communal areas. 2. The Bell Gateway Centre: This building is known as the centre’s front door. Its graceful atrium lobby leads to a spiritual centre, a state-of-the-art gym, physiotherapy facilities and a café run by patients. 3. The Doctors Association Building has several levels of parking as well as heating facilities for all of the Phase 2 structures. There are also laundry facilities, client assessment spaces and meeting rooms. 4. The Integrated Wellness Centre houses youth and geriatric programs. The youth facilities, the first of their kind in Canada, include 12 beds for patients ages 14-18. The geriatric side has 48 beds and extensive outpatient facilities. 5. 100 Lower Ossington, the first non-CAMH building on the campus. The eight-storey building includes 179 apartment units, many low-rent. 6. The McCain Complex Care and Recovery Centre will be the signature building of the transformation. Its inner courtyard will be open to the public and lead to a new park (see #10). The building will house people recovering from acute mental ailments as well as an auditorium and library that will both be open to the public. CAMH’s brain stimulation centre will also find a new home here. 7. This building is slated for demolition, with Stokes St. then being pushed through to Shaw St. through an opening in the brick wall. Parts of the wall date back to the 1850s. The brick wall, which still surrounds centre property on the west, east and southern sides, includes a pair of work sheds. 8. The new Crisis and Critical Care building will serve patients with acute mental health and addiction issues and house a round-the-clock emergency department. 9. This unfunded phase of development is expected to take at least another decade to complete and will replace much of the remaining 1960s stock of dreary buildings that housed the centre for nearly half a century. How can a person avoid a mental health crisis? The answer is very likely hidden in the billions of bits of electronic data the Centre for Addiction and Mental Health has collected on its patients over the years. Sean Hill will try to find it. Hill, who was recruited from the prestigious Blue Brain project in Switzerland in September, is the inaugural director of CAMH’s Krembil Centre for Neuroinformatics. And he and his team will employ Big Data-crunching computation and artificial intelligence to sift through patient records seeking answers to such vital neurological questions. For example, Hill says, a data-crunching search through records detailing patient activity, sleep, nutrition and mood patterns might reveal triggers to various psychiatric conditions. The centre, which opens this spring, will use its own cluster of computers as well as off-site supercomputers to mine the data. It will also collaborate with similar centres across the globe to advance brain science, Hill says. In Switzerland, Hill’s work with the Blue Brain project — a collaboration between IBM and the École polytechnique fédérale de Lausanne — created detailed models of brain circuitry. A New Jersey native who earned his doctorate in Switzerland, Hill says the determination of CAMH president Dr. Catherine Zahn to make the centre a world leader in mental health research was a key reason he came to Toronto. Neil Vasdev is coming home. Home from Harvard Medical School and Massachusetts General Hospital — where he held prestigious positions at two of the top health research facilities on earth for the past six years. But in the end, the Oakville native’s July decision to come back to CAMH — where he worked from 2004 to 2011 — as the centre’s chief radiochemist was a simple one. “Really it is an honour returning to CAMH and the University of Toronto, especially … having roots here,” Vasdev says. “I would say the decision to return was quite easy, knowing I would have so much support” from CAMH leadership. Vasdev, who holds the new Canada Research Chair in Radiochemistry and Nuclear Medicine at U of T, will also serve as associate director of CAMH’s Research Imaging Centre. That centre has been a world leader in the development of the radio-tracer chemicals that allow scientists to see the workings of drugs in the brain, and other neuroprocesses. It’s produced more than half the radio-tracers now in global use. Vasdev, who was still using his Boston cellphone during a recent interview, was recruited there in 2011 to set up and run Massachusetts General’s new radiochemistry centre. He began his return engagement at CAMH in November but was still settling in at the centre this month. Vasdev earned a PhD in chemistry from Hamilton’s McMaster University and was an associate radiology professor at Harvard during his time in the U.S.
Radio tracers can be attached to drugs without changing their chemical properties. They then make the drugs visible to positron emission tomography (PET) scans of the brain. Vasdev says researchers can then determine which parts of the organ the drugs are affecting, the duration of that impact and other factors. He will help build CAMH’s new Azrieli Centre for Neuro-Radiochemistry on College St. This entry was posted on Saturday, January 13th, 2018 at 10:30 am and is filed under Health History. You can follow any responses to this entry through the RSS 2.0 feed. You can leave a response, or trackback from your own site.